Following these is entirely at your own risk as is following any of my routes. 1. Most of the described trips are by me walking alone (with a 25lb rucksack, hence slowish timings). Unless you are a very experienced mountaineer, this is not a good idea. Go with a trusted companion. 2. Don't rely on anyone speaking English, especially in up-country Austria or Switzerland (German or in West CH, French) or in Italy, where French may be useful in Piedmont. You are off the beaten track. 3. Carry a light, smart, outfit for the occasional hotel if you are in to washing. 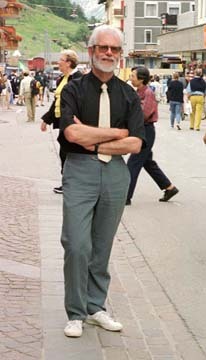 See me in Zermatt on the right in 1999. This outfit weighs less than a pound. 4. Others advise 'take a mobile phone'. I don't, as when I started in 1956, I didn't have any phone. Do as you please but don't take risks because you think you can always whistle up a helicopter. You can but they are very expensive. 5. Join a European Alpine Club as you get a deal in the huts. I am a member of the Swiss Alpine Club, see right. 6. Even on the 'non-Alpine' walks, take an ice-axe. 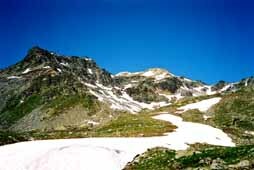 In June in particular & often going on into mid-July, paths may still be smothered under winter snowfields. On the photo right (on Bella Tola), the middle-distance ones are about 45°, which is steep. Back down, kicking each step twice for security. Move only one limb at a time carefully. This is tiring. 7. One seems to be able to walk further in the Alps than in the Lake District. Something to do with the air. But take plenty of water. When I turned 53, I started taking two litres, an extra 1.75lb, as personal temperature control is harder as you get older. 8. Despite the generally good path marking, I don't need to remind you to take maps & a compass, do I? The photo shows the quality of Swiss signs, which are expressed in hours walking. These times do not allow for stops, so take a conservative view of them. This is one near Grächen. 9. Bergwegs are marked with red splashes of paint (see right). A bergweg might include scrambling, as here. You don't lose brownie points for using your hands! There are sometimes danger spots on bergwegs, occasionally marked as such. 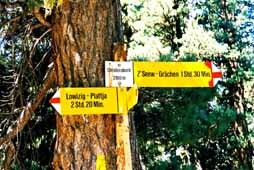 Wanderwegs are ordinary easy footpaths, marked with yellow paint & often, yellow diamond-shaped signs with 'Wanderweg' painted on them. 10. 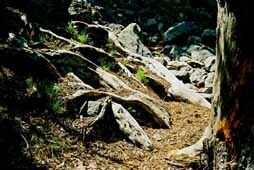 This may seem trivial but tree roots are usually slippery & always so when wet. Tread on the choss between them if you can. These (see left) have clearly been polished by boots slipping, which causes a rush of adrenaline & tires you out. In June-July, see point 6 above but you do get the best of the alpine flowers. For crowds & occasional difficulty in getting a bed, go late July through August. For often settled weather & the least problems with routes, go in September but winter may start coming down as early as mid-September. October is for Autumn colours, see my Saas-Fee pages but many paths may be closed by snow. WARNING about Italy. Check for public holidays, when everywhere, not just the Alps, is booked solid. To join the Italian Alpine Club, hit this link. He can tell you how to join the SAC. This link is to the British Mountaineering Council. URL: http://www.art-science.com/Ken/Alpine/hints.html Last revised 28/5/2005 © 2000-2005 Ken Baldry. All rights reserved.